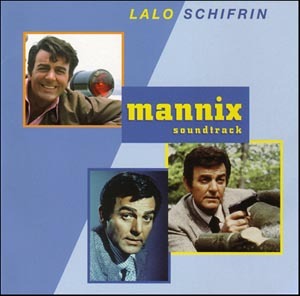 In 1999, Lalo and Donna Schifrin asked me to pen the notes for their re-recording of his music for the long-running private-eye series Mannix. In addition to the 11 tracks on the original 1968 LP, Lalo wrote four new tunes to bring the running time up to a more CD-friendly hour’s length, then recorded them with Germany’s phenomenal WDR big band. It gave me a chance to talk with the composer about producer Bruce Geller’s ideas for the music… and to ask series star Mike Connors about it: “I used to walk down the street and people would hum the theme at me. Lalo’s terrific, and his music is sensational,” he said. It’s a terrific album and I am proud to have contributed a little something in terms of context. This entry was posted in Composers, Television Music and tagged Aleph, Bruce Geller, Lalo Schifrin, Mannix, Mike Connors on June 1, 1999 by Jon Burlingame.